Earn up to 6,000 reward points. Tube or solid state? This head's got 'em both. The Markbass Little Mark tube amp head gives the warmth and richness of a tube preamp, the clean attack of a solid state preamp, or a mix of both. The bass amp head features a mix control for mixing between a solid state preamp and tube preamp. The result offers a range of sounds, from the crisp, Markbass sound in the solid state, to a heavy tube sound in the tube state, and anything in between. On the front panel there are 2 inputs with separate gain controls: one 1/4" jack, and one combo jack that accepts either an XLR or 1/4". The Vintage Loudspeaker Emulator (VLE) and Variable Preshape Filter (VPF) allow access to a wide array of timbres, from classic tones to modern hi-fi sound. A phantom power switch accompanies the XLR input, for using a microphone on a double bass. Mute control is as simple as a push and a pull on the master volume switch. 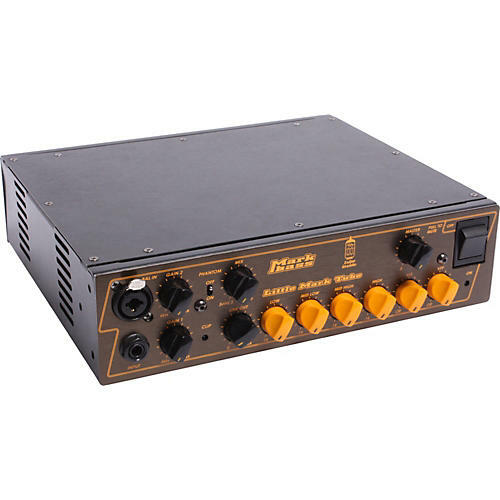 The Markbass Little Mark has 4 bands of equalization, line out control, and pre/post EQ switch for the XLR out (on the rear panel). Rack ears not included. The bass amp head features a single 6205 miniature tube. Whatever you consider your perfect sound, the Little Mark Tube has it. Order today.